A new University of Hawaiʻi at Mānoa study has produced a new technique involving heat that could help prevent nuclear power plant accidents. Boiling is usually associated with heating, however, in many industrial applications associated with extremely hot components, such as nuclear power plants and metal casting, boiling is used as an effective cooling mechanism. This is due to "latent heat," the heat absorbed to change water into vapor, which removes a huge amount of heat from a hot surface. There is a limit to the amount of heat that can be eliminated through boiling. Increasing this tolerable heat limit is important for many reasons, but especially for safety. Sangwoo Shin, an assistant professor in mechanical engineering at the College of Engineering, has demonstrated a novel concept that overcomes the tolerable heat limit or what's known as the critical heat flux (CHF). He leads a research team that has come up with a new method that increased the CHF by 10 percent compared to approaches used in the past. According to Shin, this is important because, if the surface is extremely hot, the water near the surface will quickly change into vapor, leaving no liquid to use for cooling the surface. "The result of this failure of cooling leads to a meltdown of the heated surface, as witnessed from the disaster at the Fukushima nuclear power plant in 2011," explained Shin. The incident was prompted by the Tohoku earthquake that struck eastern Japan, which generated a tsunami and disabled the power and cooling systems of the plant's reactors. "In this regard, extensive efforts have been put into increasing the CHF," he said. To date, one of the most effective ways of enhancing the CHF is by roughening the surface with nanostructures, specifically, nanowires. High surface roughness leads to an increased number of sites at which the bubbling occurs, thus resulting in enhanced CHF. 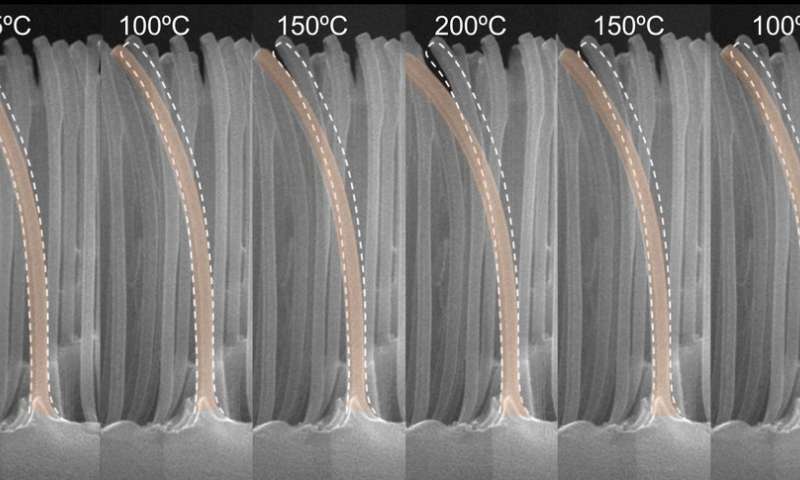 The study found that boiling heat transfer was much more favorable with a new concept that involves coating the hot surface using nanoscale bimorphs, a piece of long metal that can bend when exposed to heat due to thermal expansion. The hot surface causes the bimorphs to deform spontaneously, which makes the surface condition to be more favorable for boiling. Shin says future studies to further CHF enhancement can be expected by choosing the right geometry and material for the nano-bimorphs, which may contribute to developing energy-efficient technologies for extremely hot systems. This new finding, a collaboration with researchers from Yonsei University and the University of California Riverside, was recently published in Nano Letters. Interesting, but never explains why the bending of the biomorphs enhances boiling and why the dynamic bending (as opposed to just having the high heat shape) is beneficial.